Nicole's Needlework: I Went to a Stitch-In! I got Birds of a Feather Alphabet Sampler for only $1! I also got The Goode Huswife's A Quaker Four Corners Sampler, Country Cottage Needleworks A Place We Call Home, and a pack of needles. :) It was definitely a good night and hopefully I can go back next week! Write more later! That sounds like a very nice night to me! You picked up some very nice patterns! Thanks for the info regarding the store in Dunedin. If I am ever in the area, I'll be sure to drop by! sounds like you had fun. nice charts you got-I especially like the Quaker pattern. Good for you for getting a break! 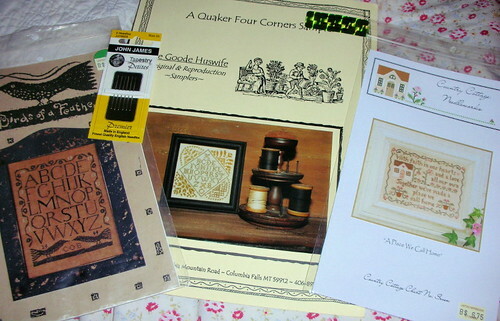 Your new stash is interesting -- I think i have the Quaker 4-corner sampler, too. 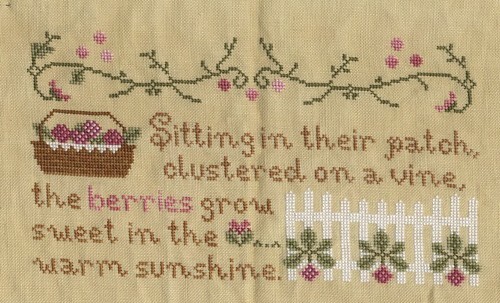 What fun to get out of the house & chat with needleworkers. I really like the designs you picked out! Great deal to get that BOAF pattern for only $1!